The ancient greeks already knew, that food and drinks keep body and soul together and thus it shouldn’t be surprising, that numerous new websites about cooking, recipes, cuisine, gourmet, soul, natural and organic food are popping up every day. However, every single food website is unique and can provide valuable content about food related topics, like different types of cuisine and dishes, traditional or gourmet recipes, cooking and baking or natural and organic food. If you’re running WordPress websites, you can use food WordPress themes which have especially been developed and designed to display recipes in a well-organized way or present nice images about delicious dishes and let users engage with your website content. Depending on what you have in mind, you can have a look at our food WordPress themes collection and see if you can find your favorite food WordPress theme that meets your personal needs and requirements. We have collected some great food WordPress themes which are suitable for food blogs, professional business food websites, organic online shops or nice cooking websites to share recipes with your community. Some of the themes we’ve listed provide such nice features as recipes editor forms, WooCommerce compatibility, parallax effects or Google Recipe View. 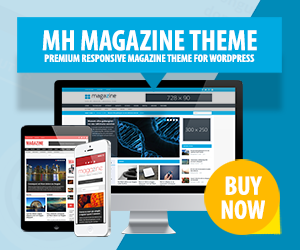 MH Magazine is a flexible WordPress theme which you can use to create modern editorial websites and blogs about different types of cuisine, cooking and baking or other topics related to food. Using the several included awesome custom widgets, you may display your latest articles about new recipes or last nights cooking session. When using MH Magazine you have lots of flexibility to tweak your website according to your personal taste. You can for example choose a suitable color scheme, select neat typography or arrange your front page widgets in a well-organized and appealing way. Organic Food is a clean and fetching WordPress theme with some nice parallax effects. This fully responsive food WordPress theme is suitable for websites related to organic businesses, like organic stores, organic blogging or else. With Organic Food you may also create an online shop using the popular WooCommerce plugin to sell organic or natural food products to your valuable customers. Steak House is a professional food WordPress theme which is perfect to create websites about cooking, restaurants, vineries, food, gourment, recipes or similar topics and businesses. This fully responsive food WordPress theme comes with several unique custom widgets to present your content accordingly and to provide helpful information for your customers. Talisa is a beautiful and neat food blogging WordPress theme which can be used to showcase all kinds of different recipes submitted by your website users. You can thus create a vivid online community around your food website to share latest recipes and food news with each other. Thanks to such great features as recipe ratings, fully responsive layout, useful customization options and more awesome stuff you can set up appealing food websites with ease. Food & Cook is a charming, clean and responsive multi-purpose WordPress theme which is perfectly suitable for all types of food related websites, food blogs or else. Food & Cook offers some awesome features like WooCommerce compatibility, easy video embedding and several nice page templates to take advantage of and build unique and individual food websites upon. Food Recipes is a flexible food WordPress theme with fancy and useful customization options. Your users can for example easily submit their latest recipes through the frontend of your website to share them with other users and cooking fans. Food Recipes WordPress theme offers a beautiful, pure overall design and lets your content stand out and speak for itself. Chow is a cool food blogging WordPress theme which is suitable for fresh websites about recipes, food and cuisine of any type. This modern food WordPress theme provides support for Google Recipe View and Schema.org to let search engines find and display your recipes more easily and more likely present them within their listings. Using Chow food WordPress theme, you can also let users sumbit and store recipes and thus let them interact with your website. Organique is a 100% responsive food WordPress theme which can be used to create modern online stores and sell food products by using the popular WooCommerce plugin. Organique is ready to be customized in various ways and offers many great features to create pages by drag & drop, choose from unlimited colors, different layouts or several shortcodes. CookingPress is a nice food WordPress theme which is ideal to showcase recipes of any cuisine, be it asian, italian, indian or from your very own tradition. This food WordPress theme is specialized to handle lots of recipes in a well-organized way. Website visitors on the other hand can search for certain recipes by ingredients and will benefit from rich search results. Gustos is a community food WordPress theme which is ideal for food related websites to share latest recipes with the community. This nice community WordPress theme comes with several great features to tweak your website according to your personal taste. Gustos provides attractive member profiles and a useful messaging system to let users connect with each other. TastyFood is a food blogging WordPress theme which was designed and developed for food bloggers. With TastyFood you can easily share new recipes with your community and display them nice and prominently on your website. Thanks to the neat gallery feature, you can upload images of your delicious food creations, latest cooking sessions or else. How did you like our collection? As this food WordPress themes collection illustrates, there are all kinds of different food WordPress themes which are suitable for various types of websites related to cooking, cuisine, food online stores, organic food or sharing and displaying recipes. How did you like our collection and what is your favorite food WordPress theme? Feel free to provide some feedback in the comments below. All these WordPress themes are excellent. Can you please suggest me some food responsive themes which are automatically doing everything, like meta title, description, schema, etc. Actually, I don’t want third party plugins. One plugin is for SEO purpose another plugin is for schema etc. I need one WordPress theme which is doing also SEO on page activity properly. The reason for this is because it’s very bad practice to code a WordPress theme like that because all the SEO data will be locked into the theme and if the user switches the WordPress theme, that data will be lost and can’t easily be accessed anymore. That’s why there are professional SEO plugins to add this kind of SEO meta data. It’s good practice to use SEO plugins and you won’t have any disadvantages by doing so. Here you can find some plugin recommendations: WordPress SEO Plugins. Hi, your restaurant based theme listings are helpful to me. I will use a theme for my website. I have one more theme suggestion for a food business which is FoodFork WordPress theme. It is a premium responsive WordPress theme for restaurants and food business websites.